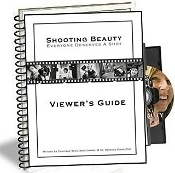 The Shooting Beauty curriculum includes a teacher's guide with lesson plans, discussion questions and activities that cater to different teaching time frames and levels (appropriate for 6th grade through Graduate level), 'How To' and word guides, ideas for taking action in your own community, tons of photographs & much, much more! Institutional DVD included. Open captioned version of film included on DVD.